The Band first made a name for themselves as Bob Dylan's backing group who went on tour with him at the very beginning of his electric phase. Yup, they played an integral part on one of the defining moments of rock 'n' roll. But that's not the only thing these guys were good for. They also played an integral part in jump-starting the roots-rock movement that, only a year or so later, dominated the field that was then stuck in the realm of psychedelia. Out with the old, in with the new. That's not to mention that they also happened to be high-class professionals who were undoubtedly some of the best instrumentalists in the business. They were also very cooperative players, and there doesn't seem to be anyone here who is trying to stand out above the others. There's a feeling that every member cared more about the music they created than themselves. That's partly what makes this album so appealing. They're so solid and well-versed in their respective instruments that it even makes up plenty for tracks that might not be extremely notable in the melody department. As great as Dylan is, he's not the only good thing here. “The Weight,” a Robbie Robertson creation, is a song so earthly and organic and so American that I believe the only proper way to listen to it would be driving around the rural countryside. The melody is also probably the album's most memorable. “Chest Fever” is also a sheer highlight, and that's for no other reason but the organ! The intro strongly references Bach, and it's a dark, evil sounding thing that captures me every time I listen to it. That rivals “A Whiter Shade of Pale” as one of the best uses of that instrument of rock 'n' roll. There are a few moments in here that don't seem so notable to me. “To Kingdom Come” is a tad bereft of inspiration, but the instrumentals are as earthly and appealing as ever. I'm not the world's biggest fan of “Caledonia Mission,” but I'll tell you that song has really grown on me over the years and I'd wager there's room for it to grow even more. (I have a feeling my lack of enthusiasm for it stems for my general distaste for blues music.) “Lonesome Suzie” is a nice touching ballad, but it's so sluggish that it nearly gets boring. All that said, they might be difficult for some first-time listeners to get into. I'll admit I had a difficult time with them the first time I delved in their music sometime in 2002. After all, this certainly isn't pop music, and as I said earlier, sometimes their melodies aren't that notable. But they had such a rich and compelling earthly atmosphere that once you give them their due chance, you'll find The Band and Music From Big Pink as comfortable as a pair of old shoes. There's also a wealth of material in the bonus tracks. “Katie's Gone” is probably the best of them, but you should hear the innovative instrumentation in the sloppy but fun “Yazoo Street Blues,” and a bluesy Dylan original “Long Distance Operator.” I wrote small paragraphs about these in the track reviews, so consult those if you want more information! Here it is. One of the most critically acclaimed albums on the planet Earth, and all I can say is it deserves it! The Band has one of the most amazing first halves that I've ever heard. Rarely has there ever been such an assembly of songs this intricately crafted with so much depth! I mean, these are songs that you can immediately take to heart. They're expanding on greatly on that Americana sound they had brought us in their debut, and they manage to come up with what sounds like the genuine article. Opening the album, “Across the Great Divide” is a great, upbeat and punchy song with catchy melody and swinging horn section. It's a perfect ode to the Old American West. (I've crossed the Great Divide by car a number of times, and it's hard to keep this song from popping in my head.) What it has over the opener of the previous album is that it's almost danceable. Certainly not as deep as the Bob Dylan co-composition, but it's a lot more fun. As enjoyable as that song was, it's not nearly as enjoyable as “Rag Mama Rag,” arguably the most entertaining song of their whole discography. As you'd expect from the title, it's a take on ragtime. You can picture what the piano's going to sound like, but there's also some lighthearted, skiffley guitars, plucky banjos and a tuba that's deeply plomping around. It's wonderful! As Rock Album-Making 101 prefers it most, the third track is a ballad ... and what a ballad it is! “The Night They Drove Old Dixie Down.” Chances are you've heard that one before. It's a beautiful and it gives us a taste of good, old country music without even singing with an annoying accent or singing about a dead dog. In other words, this is how country is supposed to sound like. Garth Brooks doesn't even know the half of it. “Up On Cripple Creek” is probably another song that you've heard before. It has that unforgettable quasi-funk guitar part, and a melody that's the catchiest thing ever! 'Nuff said. That was a difficult song to follow-up, but they'll surprise you with “Whispering Pines.” It's an atmospheric ballad like none other ... something that tries to grab you and take you through a journey though this cold world they're describing in the lyrics. As corny as it is to say so, that's a special experience. They follow those up with two similar but inevitably lesser songs. But they're still great, and they deserved an A! “Jemima Surrender” is another upbeat ditty that'll have you hopping up and down. And “Rockin' Chair” is an extremely compelling cowpoke ballad. Then there's the final four tracks. “Look Out Cleveland,” a well-written and composed song, but it lacks something that the others had in spades: Charisma! In other words, it's *just* a good song. The melody isn't as pretty and the instrumentation not quite as innovative. “Jawbone” is another fine work and another notable attempt at this Americana sound they were pursuing, but that one also fails to capture my imagination. “The Unfaithful Servant” is respectable ballad, but this is actually a little boring. Oh no! It does get more exciting with the closer, “King's Harvest (Has Surely Come).” It has an unusual structure, but I can't really get too engaged in it. It has some very good guitar parts, though. Even though these final four songs have a negative impact of this album's score, The Band is still an experience that anyone who wants a good taste of Americana music will have to visit. Even if you don't want to hear Americana music, you should definitely find some time to give it a listen. I have an inkling that you'll like it lots. And after you're done with that, I'll tell you that a few years later, a British band would release an Americana album that managed to top this. That would be the Kinks' phenomenal Muswell Hillbillies, which was obviously influenced by this. (Don't worry about a bunch of Brits taking the title away from The Band. The Band consisted mainly of Canadians, after all.) Even though The Band might contain a substantially weak ending, absolutely nothing can alter the fact that the first eight songs are some of the finest works ever composed in rock. The last four tunes might keep this out of my personal Top 25, but I can say it has a comfortable position in my Top 100. It's an excellent album. I should also mention that this is nothing like The Band. That disappointment has long since wore off me, but if you purchase Stage Fright hoping for something similar, you'll find otherwise. Understandably so, they weren't even trying for something of that caliber, since they're both so difficult to top. They're human beings, after all, and they didn't have the energy... According to some reports, they didn't even have enough energy to cope with the amount of popularity they were getting at this point. 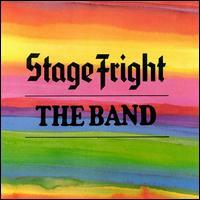 Stage Fright consists of straightforward rock music with exceptional instrumentals, but not-so-exceptional melodies. ... And that's not to say the melodies are bad, they're just flat sometimes. And the atmospheres aren't so thick and charismatic. “The W.S. Walcott Medicine Show” is the catchiest song of the album, but that sort of vocal melody you would commonly find at an average Broadway production. Indeed, the most appealing aspect of that song, and all the others, are the instrumental ideas. This song has a bouncy riff, music-hall piano and a pretty cool sax solo in the middle. It's perfectly mixed and there's not a sense that any of the instrumentals are trying to stick out, which is often goes as an untold distraction in other albums I review. “Strawberry Wine” is a solid opener featuring some fantastic light guitar licks. They seem to be referencing Chuck Berry, but that combined with the funny accordion noodling we hear in the background and a meaty bass guitar, everything about it is fresh. (Except the vocal melody, which is a predictable bluesy thing.) “The Shape I'm In” sees these guys constantly changing around textures. That's a good example of a song that you can deeply appreciate, but I have a feeling most listeners except for music theorists would particularly care to pay attention to that. (But, then again, anyone with Band albums must be *music* fans, so they'll probably notice.) I like certain aspects of that melody, actually, especially that vocal layering thing they do ... which sounds wonderful with stereo headphones. I've gotta mention my marked disappointment with the last two songs. “Stage Fright” has an interesting open sequence and a really funny synthesizer playing scales very lightly in the background. Hey, I never complained about the instrumentals, have I? Just somehow the experience doesn't do much of anything to me, and I'm willing to blame it on the dull chord progression. “The Rumor” isn't bad, but it also doesn't do anything for me. The instrumentation is less involved than most of the other songs, and as expected, there's nothing much in the melody to make up for that. Just lackluster. Just one more song I'll note (there's always the track reviews if you want more details). I especially love certain aspects of “Daniel and the Sacred Harp.” That accordion intro is odd, and a rather prophetic reminder of those tacky Commodore 64 video game soundtracks. (That's a compliment to them ... that's intentional tack!) They were changing the textures around a bit there, but it's not quite as interesting as it was on “The Shape I'm In.” It also has some not-too-flashy additions from home-style fiddles. This song is another textbook example of their stunning subtlety. They knew exactly what to do without there ever being a single instrument that was stealing the show. Legend has it that Eric Clapton asked to join the group ... but he was denied, probably because he would've wanted to show off too much. And what's to stop him? He's Eric Clapton, dammit! These are very cohesive songs, and that's exactly why Stage Fright is so well appreciated. I'll close by saying that you probably shouldn't let my less-than-enthusiastic assessment discourage you from looking into the album. Most critics like it much more than I do, and – besides -- I do actually like it. Even if you have the same impression of it that I do, you'll respect the hell out of it and feel proud that it's in your album collection. But if you're anything like me, you won't listen to it very much. 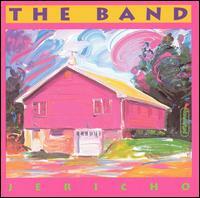 It's unfair to call In Cahoots pale imitations of Music From Big Pink and The Band. Yeah, they might be on some definitions, but you can tell they weren't even trying to top those albums. Clearly, they spent less time developing the material, and their inspired creative juices had almost entirely been drained. (Unfortunately, these guys aren't Bob Dylans; they can't come out with inspired material every freaking second! They're mortals!) Even some of their instrumentation values seemed to be not up-to-par with much of their earlier work. Sure, it's great ... but some of it seemed pretty sloppy. More of that later. Making it worse is the fact that this is exactly the same sort of thing they've been doing since the beginning ... Americana. They were never too interested in evolving. But if you like that style, then you'll surely be left satisfied! “Life is a Carnival” is very nearly a funk song. (And don't let that fool you ... “On Cripple Creek” was very nearly a funk song, too.) It has some funky horns and guitars that were well utilized, but it's not real funk because it sounds so robotic! It's an unusual take on the genre, and I think it turned out well. Bob Dylan gave them “When I Paint My Masterpiece,” which has a rather normal country-western style melody but with an appealing European sound from the accordion. It's striking how unusual it is, and also how well the combination worked. “Shoot Out in China Town” is a minimalist track with a nice groove (that gets a little bit tired after awhile), but the chorus is awesome and I like those Eastern-tinged guitar licks they give us occasionally. “The River Hymn” is a bit of a mess, but I like those layered-on choir voices they give us in the chorus. It's an overall charming work. Of all the songs, for some reason “Volcano” strikes me the most. The atmosphere is easily the thickest and solidest work on the whole album. Nothing about it particularly exciting, but it's all very professionally done. The horn sections help give the song its towering atmosphere, and I fall in love with that sax solo in the middle! Also, I think that melody is quite nice. It's nothing that you'll want to sing to yourself tomorrow morning in the shower, but it's charming and works at the level they presented it. The chorus is nearly mind-blowing. “4% Pantomime” is an example of where their instrumental sensibilities seemed to escape them for a short while. They brought in Van Morrison to help co-write it, but the two completely different factions didn't manage to create something of genuine interest. The instrumentals are all over the place. The piano sounds like it's trying to be a pop song, and the wobbly guitars are doing their usual country-western thing. It's all professional, but it doesn't sound *together* as they would typically make it. Making it worse, the vocal duet is annoying and the melody is disinteresting. This is quite easily the worst song of the album, and there are a few others I'm not thrilled about, which help drag this album down considerably. Since it's clear these guys aren't going to try repeating the mind-blowing success of their previous albums, we can enjoy their later albums to a considerable degree. I'm not thrilled about much of this material, which is “lackluster” at best. Anyone who doesn't care for this group's highly praised classic albums really wouldn't get much out of this. (If they do, I'd be surprised, especially since much of this is just a retread of what they've already accomplished.) However, the highlights are good enough that Cahoots is a worthwhile experience for their well-established fans. It's a pleasurable experience, if a mild one. The Band were well-renowned for their live performances, and here's 28 tracks worth of proof. A walloping double album featuring some of the most riveting instrumentals I've ever heard in a live album. What's amazing is the band continues abiding by their studio “philosophy” of not letting a single band member take the spotlight (that is, apart from a seven-minute organ solo called “The Genetic Method,” but, trust me, that solo is awesome). The first disc of 18 tracks was the original LP and the final 10 tracks, on the final disc, are all bonuses. Writing the track reviews was a particularly cumbersome task and I filled up an entire four word processor pages with those! (And that's important for readers wanting more details, because there's no way I'm going to be able to discuss, in detail, every notable highlight up here.) But I'm not complaining. After that process was finally completed, I can gleefully report that my time with that was well-spent! This is quite possibly the coolest live album I ever had the pleasure of reviewing. Of all these songs, I've been able to single out their interpretation of “Rag Mama Rag” as the definitive highlight. 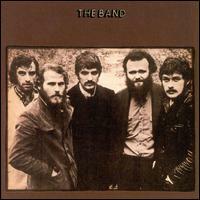 It's one of only a couple occasions where they managed to greatly improve a song that appeared on the mother of albums, The Band. That was quite an instrumentally involved song to begin with --- every band member had something interesting to contribute to that addictive“groove.” But in this live version, there are even more instrumentalists who want to turn in their two cents at the same time. You'd think this would flood the song too much, but no! It sounds better than ever, and soaking up that beautiful texture is quite a special experience. 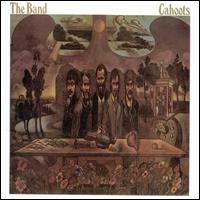 “King Harvest (Has Surely Come)” had also been greatly improved. This is also more involved and helped intensify the original experience, which I frankly thought was somewhat flat. Similarly, their new take on the somewhat disengaging “Unfaithful Servant” was excellent, and it made me reassess its original melodic merits.. The second disc isn't nearly as amazing as the first. The instrumentals sound less rehearsed than the others and much looser. The fact that Bob Dylan is present for four of these songs (the final four) understandable, since that sort of thing is his *sound*! ...These four mentioned songs certainly aren't Dylan's shining moments, but they are quite entertaining and an absolute must for his fanatics. They make the great decision to close the whole thing with a rollicking performance of “Like a Rolling Stone!” The second disc also includes a somewhat run-of-the-mill version of “Up on Cripple Creek.” Considering that it was their biggest hit, it's odd that they didn't include it with the original cut ... but I suppose they figured there wasn't much they could expand on it. Too much stuff to write about and so little space! (And I have track reviews, dang it!!) I'll conclude by saying that this is quite a live release. I do wish I could score this higher, but there's an awful lot of lackluster picks from their latter two albums! But despite that, this is a fantastically entertaining album and something that anyone interested in rock 'n' roll instrumentation ought to droll heavily over. The black sheep of The Band's discography, but the only sensible reason for that distinction is it's a covers album. But for my money, this is a more enjoyable product than some of The Band's “serious” albums. If you're into collecting this group's albums, and you don't own this one yet, then you're really missing out on a great time. Don't let one second pass you by! As covers albums go, this is probably one of the best around. Normally such albums are toss-offs that the artists use to either fulfill record contracts or just pass the time. You won't find that with Moondog Matinee. The Band prove, once again, their professionalism. Of course, you'll be hard pressed to find anyone who believes that this album was played better than their BIG TWO albums, Music From Big Pink and The Band, but I don't find any discernible difference between the instrumental quality of this and their previous two studio albums. 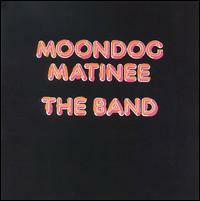 Furthermore, since their songwriting hadn't been up-to-snuff lately, it's pretty clear Moondog Matinee rules over them. They start the album with a fun bluesy number “Ain't Got No Home.” It doesn't leave much of an impression, but it's a good thing to snap your fingers to. The follow-up “Holy Cow” is a wonderful cover of an inspired tune by Allen Toussaint. It has a great mid-tempo groove and a catchy melody to boot. 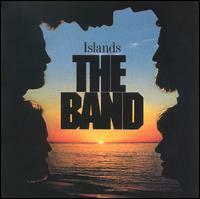 Such a good choice-of-cover for this group, too, since it wouldn't have been so out-of-place on The Band. You ain't heard nothing yet until you listened to “Mystery Train.” A very awesome funky tune with some of the tightest guitars I've heard these guys do. To boot, it contains a lighthearted solo from an unidentified instrument that can only be topped by the likes of Booker T. and the MG's! What else? There's a Chuck Berry cover (of all things) that they COMPLETELY NAIL. I know it's a cheap shot to say so, but this version is head-over-heels better than the original. I can't express it enough. In the world of covers albums, you won't find too many that are better than this. That's thanks to The Band's level of professionalism---they treated these songs as they're own. The performances are as top-notched as though it was an actual Band album, and they made plenty of great cover choices. (Well, “The Third Man Theme” is arguable... but I liked it.) Be sure to read the track reviews for more details. This was a pleasant surprise. Sure, I listened to this album a few years, and I liked it for sure, but I can't remember if I was quite ready to call it a “gem.” Well, their albums have had a tendency to sneak up and charm the pants off me when I was least expecting it. It took me about a dozen listens to The Band until it finally clicked with me. Northern Lights, Southern Cross is another one of those! But that doesn't mean it's as important as The Band. These guys had long given up ambitions of writing anything “great.” They sit back, relax and concentrate on nothing but delivering pleasant, unpretentious music. The album consists of eight tracks, but it's extended to a comfortably sized 40 minutes. They begin the festivities with “Forbidden Fruit,” arguably the best song on the disc. It's six minutes long, but I want it to go on for at least another 10 minutes after I'm done hearing it. It's so lighthearted and lightweight that I doubt anyone would hate it. It'll give the listener something different depending on how it is listened to. On the outside, it's a bouncy pop song. You'll enjoy its moderate, rubbery rhythm and its insanely catchy melody. However, anyone who likes to put on headphones and tries to capture every single little thing about a song will find plenty to capture here. The keyboardist is going slightly nuts... playing all sorts of things. Though, interestingly, you don't get the feeling whatsoever that he was trying to steal the show. The electric guitar also takes a moment to deliver a solo here, and its also subtly nutty. Though not quite as “notable,” it's important that I mention the conventional bass guitar and drum lines. Those two instruments are very straitlaced, but that's what keeps the song stable... All of this is more evidence that The Band, perhaps, was the best band as far as instrumental cooperation goes. They weren't just skilled, but vastly intelligent and with good taste! The last four songs aren't as good as the first four, but I don't have many complaints about them. “Ring Your Bell” is another quasi-funk tune. In fact, it's so “funky” that I wouldn't be surprised if some disco deejay in an up-and-coming nightclub somewhere would have tried it out. “Rags and Bones” is another lighthearted pop song that's impossible to dislike... They've used synthesizers throughout the disc, but that sound is a little more prominent here. Lucky, they treat that instrument just as precious as they do any other instrument. “Jupiter Hollow” is arguably the most unusual song here. The intricate instrumental textures shares a lot of similarities with “Forbidden Fruit.” The guitars are bouncy and rubbery, and the keyboardist sounds like he's having too much fun sometimes. I don't think anyone would argue that this album is in the same column of Music From Big Pink and The Band. I'm positive that nobody in The Band thinks that, either. 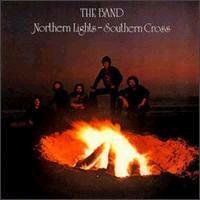 However, Northern Lights, Southern Cross is tuneful, brilliantly performed and almost insanely likable. It's probably even the third-best album of their discography. Gotta hear it! Everything seems as right as rain with the opener, “Right as Rain.” Sure, they've had more endearing ballads in their discography, but it's very pleasant and has a sweet little melody. It's a good listen on the surface and even contains a few nice textures if you choose to listen closely. The most standoffish aspect of it is that sax solo, which has way too much of a “bedroom soul” sound for me. But even with “Right as Rain” you can very subtly tell that a little bit of their soul was missing right at the beginning. It's a very ho-hum sort of song that has the tendency to go in your ear and out the others without making a distinct enough of an impression. That feeling continues right to the second track, “Sleepwalker.” It's an obligatory mid-tempo rocker with vague funk roots... yeah, The Band are famous for doing these sorts of songs! Again, I enjoy listening to it, but it sort of comes and goes without making a huge impression. To my surprise, “Ain't That a Lot of Love” can be described as clumsy, which was just about the last thing I was expecting to hear from them. The groove is very dead, and that lifeless horn section is just a reminder of that. The electric guitar solo at the end seems to try to revive it, but really it just floundered from the very beginning. I'm sorry! The melody doesn't do anything interesting, either... It's a typical bar-rock melody, and that already tends to be a genre that doesn't interest me much. At least The Band find time to provide a minor highlight with “Christmas Must Be Tonight.” In 1969, surely they would have worked on developing a more engaging atmosphere... It does sound a little flat, but I do like listening to it anyway. It has that feel-good feeling to it, and I wouldn't be too surprised if it becomes something people remember for holiday seasons to come. Their cover of “Georgia on My Mind” also turned out to be surprisingly good. Sure, that song was nothing more than a political advertisement for Jimmy Carter's presidential campaign, but it's that earnest vocal performance that draws me in! Plus, as you hopefully already know, that melody is a peach! I'm not to impressed with the title track's melody. But it's an instrumental, and that's probably the best showcase for their textural abilities in this whole album! I also have to point out that “Twilight” in the bonus tracks is worth hearing. It's a mid-tempo rocker that vaguely reminds me of reggae... Its melody isn't anything wholly unique, but that keyboardist does a few interesting maneuvers and at times sounds like he's playing something out of a spaceman movie. I didn't hate listening to Islands, but this is the sort of album I'll probably never hear again ... unless I decide to rewrite these reviews. This triple album is often considered one of the great live albums in rock 'n' roll history, but it's not even the best live album in The Band's discography! 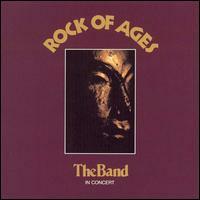 (Seriously... for the ultimate live Band experience, nothing shall ever top Rock of Ages.) However, the events that surrounded this concert were certainly noteworthy. 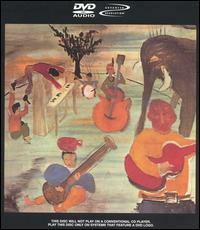 This was the point where Robbie Robertson decided to call it quits and dissolve The Band. To celebrate, they gave a huge concert with a plethora of guests! 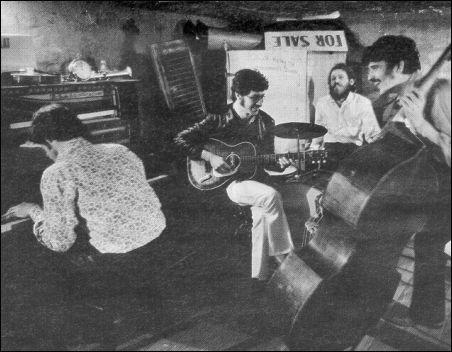 Their first guest was Ronnie Hawkins, who was the first person to work with The Band. They invited the likes of rock 'n' roll bigguns, Neil Young, Joni Mitchell, Neil Diamond, Eric Clapton, Van Morrison and Bob Dylan. They invited two notable blues musicians Muddy Waters and Paul Butterfield. They even invited two renowned Cajun musicians Dr. John and Bobby Charles! (And, they brought in Ronnie Wood and Ringo Starr at the very end, probably as a joke.) That's a FREAKING HUGE CAST! This event was huge enough that, as 99.9% of the world's population is already aware, Martin Scorsese decided to film it. And The Last Waltz became the most famous concert video ... ever. Somehow the weakest of the guest musicians ended up being Van Morrison. Can't say why that is, because I like hearing his studio albums just fine. But somehow the two songs he contributes “Tura-Lura-Lural” and “Caravan” don't quite cut it for me. The former came off as slow and a bit overblown. The latter was more exciting, but a bit too long. I'm sorry! But I loved Joni Mitchell's performance of “Coyote” (it's always a pleasure to hear her). Neil Diamond's performance of “Dry Your Eyes” was incredibly rousing! The whole point of Eric Clapton's performance was to showcase his guitar abilities. Legend has it that Clapton wanted to join The Band in the '60s, but they wouldn't let him. Probably because he'd always want to be showcasing his guitar!!! But anyway, very few guitarists could ever hope to top those fingermelting solos that he does! Muddy Waters' contribution could be the most out-of-place one here, because it's an incredibly repetitive blues song that uses the most commonly used riff in history. But it's that's guttural, on-your-seat vocal performance that makes you take notice. The blues is outside of my area of expertise (to the extent I have “expertise”) and I usually can't stand the blues ... but when it's done this well from one of the original masters, it makes me want to delve a bit deeper into the genre. Naturally, the centerpiece of the whole concert was BOB DYLAN. He's not only the most well-revered figure who showed up there (especially considering the audience), but he's the guy who made The Band famous. The Band was with Bob Dylan right there when Dylan went electric. So, he got to do four songs! One of them was “Baby, Let Me Follow You Down,” which is a cover that he originally performed on his debut album. (And it's a HECK OF A LOT BETTER here than it was there, I might add). However, Dylan's performance of “Forever Young” is the major highlight of his set ... and the highlight of the whole album if you ask me. Not only is the melody incredible, but the backing instrumentals are juicier than ever!!! ... And those who saw the film probably still remember that everyone came on the stage at the end to sing “I Shall Be Released.” It's overwhelming to hear so many voices, so that's certainly a moment that best experienced while watching the movie. So, The Band had that huge 1978 send-off, which turned out to be one of the most famous send-offs of them all thanks to a first-rate Martin Scorsese documentary and an all-star cast of guest musicians. But apparently, the only member of The Band who actually wanted to dissolve the group was Robbie Robertson. The rest of 'em were still keen on continuing. (Except for Richard Manuel who was feeling a tad depressed.) They did some touring in the early '80s and even recorded some material, most of which ended up on this 1993 album. Why they waited so long is possibly because of the Scorsese film! It's not good form to tell everyone you're breaking up forever and then, four years later, coming back! But anyway, here it is in all its glory. 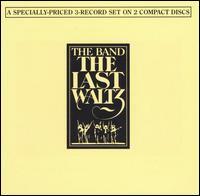 A post-Last Waltz Band album! And anybody who assumed that a post-Last Waltz Band album, one that's without Robbie Robertson, must be cut-rate is smoking crack. This is just as good as their classic albums!! (Well, except for their classicest classic albums, that is.) They manage to prove unquestionably that the old buggers weren't quite ready to end their run. The first four songs are so excellent that their merits alone make this album a must-hear to anyone who even vaguely enjoyed their back catalogue. “Remedy” is the upbeat opener, and it's done in that bar-room *swinging* style that's one of their most easily recognizable trademarks. The melody is probably one of the catchiest that these guys have ever done, and it's a pure blast from beginning to end. Its only possible flaw is that running length... I believe a more succinct version of it would've been more effective. The second track is a Dylan cover, an obscure song he wrote in the '80s called “Blind Willie McTell.” It's an excellent song, and I can't imagine what prevented Dylan from recording it himself! The Band continues to hold their reputations as great interpreters of Dylan's work. Not only is that melody catchy, but the instrumentation is absolutely first-rate. That horn solo at the end is especially wonderful. Yup, they might not be as fresh and vibrant as they were in the '60s, but they were far from having grown complacent. There is only original on the whole album, “The Caves of Jericho.” It's reminiscent of “The Weight,” but that's such an excellent song with a very endearing melody that I can't help but to consider it the best song of the album ... and it's even up their with some of their most classic tunes. “Atlantic City” is a Bruce Springsteen cover, and they picked a good one to play. It was an excellent song to begin with, and The Band incorporate it in their sound wonderfully. Jericho might not be the perfect album, but I did love listening to it. There's certainly no reason for Band fans to evade this, if you have been. It's not so much a “reunion” album, but a “never actually gone” album. This archive recording of a 1973 concert wasn't released until 1995 .......... I'm sure there were still one or two Band devotees around who wanted to hear this CD. After all, The Band had already released two live albums. One of them is that utterly beloved The Last Waltz, but their ultimate impression on the live album arena was Rock of Ages. These guys' live reputations were amazing! So... Could the 1995 Band fan expect more of the same in this archive recording? The short answer is no. Now for the long answer. This disc contains none of the live album magic that the group managed to capture in their earlier releases. The highlight, of course, is their rendition of “Up on Cripple Creek,” which is a big favorite. It doesn't start out too remarkably, but by the time they reach the end of it, the performance really catches some fire! ... Unfortunately, that was tragically cut short. Just as you're expecting to hear the big finale ... some sort of drum roll or something to end the piece in this huge blast, there's sudden silence. Robbie Robertson mumbles “thank you,” some announcer tells the crowd that they've just listened to great music (as if they're too stupid to make up their own minds), and it's over. Just like that. One of the problems with this album is that that it is only 10 tracks long, and two of them aren't even songs. Apparently, there was a big lightning storm at the time of the concert, and one of the tracks consists entirely of huge eruptions of thunder. A band member wonders if they should stop playing a bit, which is met with some serious objections from the crowd. Eventually Garth Hudson comes along with some strange keyboard improvisation. Not that I particularly disliked listening to it, but it's clear the guy was just passing the time. He wasn't actually doing anything interesting with it. ........And I've gotta ask them: Do you think that is the sort of thing anybody has any vague interest in hearing? Some guy noodling aimlessly with his keyboard??? The other non-song is “Jam” although I do appreciate the honest title! Sometimes jams can be thoroughly electrifying things to hear, although that's very very rare. Most of the time, jams are just a collection of noises. And that's exactly what this was. While this jam is offensive in no way, it's strictly ho-hum. Three of these tracks are covers that never appeared on a Band album. That could possibly be a reason for an incredibly dedicated Band devotee to pick this up. In fact, the album opens with a rockabilly ditty from Chuck Berry! Sure, that's a fun song to sit through, and The Band, being the high caliber musicians they are, they do it justice. But, in the end, it wasn't a truly memorable experience. It didn't make my heart skip beats or anything. It was rather flat. The instruments did nothing truly amazing. And, all I did was listen to it and move on. Another interesting cover choice was Stevie Wonder's “Loving You is Sweeter Than Ever.” I appreciate that they're picking some interesting covers, but again I can't say that it's actually worth hearing. Sorry, guys. They only perform two of their biggest known songs on here, and I already mentioned “Up On Cripple Creek.” The other is “I Shall Be Released,” which is one of the greatest songs they've ever done! But this rendition turns out to be rather lifeless. The singer (sorry... I can't recognize the voices...) sounds hoarse and way too soft in the mix. The instrumentals seem lifeless. It's not nearly as vibrant or soulful as that original incarnation! 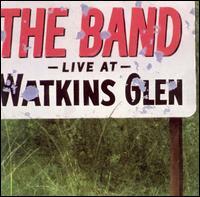 Live at Watkins Glen was a disappointment for me. I had been incredibly impressed with the two live albums they already put out, and to hear such a low quality live performance from them burst my bubble a bit. Those previous two albums showed the band alive and in-shape. They were ready to rock out and improvise when necessary. Those albums even frequently electrified some life into some of those Stage Fright and Cahoots songs that seemed otherwise bereft of life. But here, The Band sounds tired and out-of-shape. Or maybe it was just the bad weather. At any rate, this is an underwhelming disc. Don't get it unless you're a discography collector.